After having worked more than two years in the Fund Services business as a senior consultant, I still confuse sometimes the meaning and scope of some terms used in the industry. The confusing factor is not necessarily the inherent complexity of the business, but the inconsistent use of some terms in the finance community. Nevertheless, I will try to summarize here what I learned so far. Before coming back to fees and commissions, let’s have a short introduction to the industry structure in order to understand who is paying to whom for what services. Board of Directors negotiates and signs contracts with service providers (typically with the management company only as the topmost primary service provider) and oversees their performance. Investment advisory is responsible for the investment and portfolio management for the fund as well as for trade order management for the underlying assets. Custodian is typically a custody bank which safekeeps (i.e. custody) and maintains an accurate inventory of fund’s securities. Provides detailed inventory information to fund’s accounting for daily NAV calculations. Fund accountant, a most stressful job under constant time pressure, keeps fund’s cash and security inventory records reflecting trading and non-trading transactions (corporate actions); calculates & publishes daily NAV per share values; passes dividend and interest payment information to transfer agent, which calculates the distribution amount for each shareholder and makes the payments; prepares financial statements for annual and semi-annual shareholder reports. Distributor sells fund’s shares to investors (shareholders) either directly, or indirectly through intermediaries like brokers or third party financial advisers and planners. Transfer agent is responsible for shareholder record keeping (back-office) and shareholder services (front-office); distribution payments (interest or dividend) and reporting to shareholders. Shareholder fees are investor transaction and account related expenses that need to be calculated for each shareholder separately. Load funds: Funds that collect subscription (front-end) or redemption (back-end) charges from to the investors to defray distribution costs are called load funds. These sales loads are in most cases used to compensate the intermediaries like brokers or financial advisers that sell fund’s shares to the investor. Front-end load is a sales charge that an investor needs to pay when he buys shares from an intermediary. The front-end load is paid theoretically to the distributor which then usually relays this amount completely to the intermediary which sold the shares to the investor. The front-end load is deducted from the account of the investor; the rest is then invested in fund shares. Front-end loads are often stated as maximum percentage in a fund’s prospectus (for example 5% of the sales amount) due to volume discounts, also called breakpoint pricing, in order to motivate the investors to buy more shares from the same fund family. For example, according to the price table above, an investor who purchases $120,000 dollar worth of shares from the fund family is required to pay a front-end sales load of 3.70% instead of the maximum amount 5%, thanks to the volume discount. Note that volume discounts can be applied prospectively if the investor signs a letter of intent agreeing to invest a certain amount up to a certain time in future. To make everything complexer, volume discounts can also be applied retroactively (backwards in time) with an asset accumulation agreement between the investor and the fund. The back-end (CDSC) arrangement works as follows: Fund’s distributor pays a sales commission to the intermediary in advance for his sale, planning to cover this expense with the incoming annual 12b-1 fees (see below). Because the sales commission won’t be covered completely by the 12b-1 fees alone if the investor redeems too early, an additional redemption load will be charged to the investor in order to cover the rest of the sales commission. Hence the name: Contingent Deferred Sales Charges. b) They are used to defray costs related with subscriptions and redemptions within the fund’s portfolio; not for covering distribution costs. Some funds charge an exchange fee when a shareholder wants to transfer shares from one fund to another within the same fund family. Share exchanges between different fund families are usually not possible. Some funds charge a separate account fee for the maintenance of shareholder accounts. Sales loads and 12b-1 fees are called distribution fees or charges, as they are used to defray distribution costs. Purchase, redemption and exchange fees are called shareholder transaction fees to differentiate them from distribution charges. Share class A is typically for investors who plan to invest in large amounts of shares to profit from the volume discount. Share class B is for long-term investors. Share class C is a possible option for short-term investors who don’t plan to buy large amounts of shares. The institutional class I is typically reserved for big companies with a certain negotiation power because it requires a huge minimum amount of initial investment. No fees declared in the fund’s prospectus for this share class doesn’t mean that institutional investors won’t pay anything at all to the fund’s management. For I-class shares, the fee payments are formulated in special contracts between the investors and the fund management after private negotiations. Management and service fees count to the annual operating expenses of a fund. Unlike shareholder fees, these fees are generally asset-based and not transaction related. They are usually calculated as a certain percentage of the Assets under Management (AuM) in the fund’s portfolio. 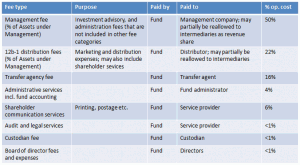 Management fee is charged for investment management and some services that are not explicitly charged to the investor under other service fee names. Management fee is the largest item in a fund’s operating expenses. 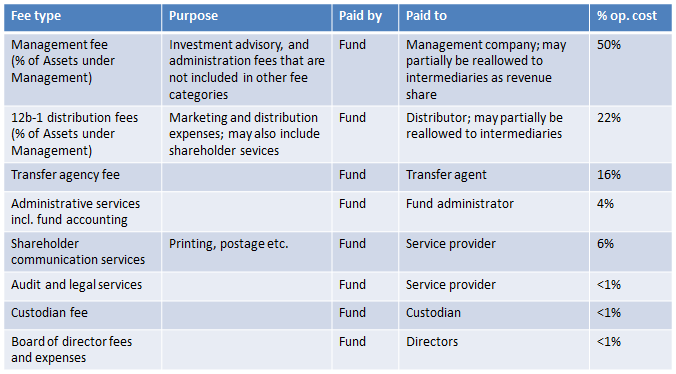 The service coverage of the management fee can vary from fund to fund. It can cover some or all of the services listed in the table above like transfer agency, fund accounting, audit and legal services. Some funds offer all-in management fees to make life easier for the investor. Most funds offer volume discounts for management fees. For example, an equity fund can offer 80 BP (Basis Points, 100 BP = 1%) for fund assets up to $10 million, 70 BP from $10 to $50 million and 60 BP above $50 million. Such tiered (or scaled) fee rates with breakpoints are defined in the official fee schedule (or fee scale) of a fund. Getting more favorable conditions for higher asset volumes is usually called volume pooling in the fund business. Asset pooling is the term used if volume pooling is offered across multiple funds from a fund family or group. Service fees by definition include all the operating expenses excluding management fee. The sum of all service fees including the annual 12b-1 distribution fee and the management fee make the annual operating expenses for a fund. Transaction-related (subscriptions and redemptions) distribution fees like sales loads or purchase fees are not counted to operational expenses. Operating expense ratio, or shortly expense ratio, is the sum of management and service fees in terms of a percentage of assets. See at the left a typical operating expense table of a bond fund. What does this expense ratio mean concretely for an investor concretely? It means, the expense ratio will be deducted from fund’s actual return every year following his investment. That is, the effective return for the investor will be fund’s portfolio return minus expense ratio. Note that the expense ratio can be different for each share class of a fund. For example, assume an investor pays $1,050,000 for a fund’s shares whose expense ratio is %1. After the deduction of a sales load of say 5%, the rest of his money ($1 million) will be invested in the fund’s shares. If the fund’s portfolio return is 4% for the following year, the effective return will be 3% for the investor due to the expense ratio. His net earnings will be 0.03 times $1 million. The expense ratio will eat up %1 of the portfolio return every year. You can imagine how the expense ratio can impact the final earnings for a compound of ten years. The expense ratio will have a more significant impact on low-risk and low-return funds. I assumed in the example above that there are no hidden costs for the investor which are not declared in the fund’s prospectus. In some cases, there can be some additional hidden costs that reduce the fund’s portfolio return. In the next related article I will introduce a simple mathematical model for distribution charges and operating expenses which demonstrates the impact of all these cost factors on the final earnings of the investor. Some fees like front-end sales loads are directly charged and invoiced to the investor. Some fees like the annual management fees are paid from the fund’s portfolio; that is, paid indirectly by the investor. There can be some pass-through payments, like the trailer fees that are transferred by the fund’s distributor to the intermediaries as a percentage of the annual 12b-1 fees paid from the fund’s portfolio. Even though some of these fees are paid indirectly from the fund, the investor is aware of all these costs because they are declared transparently in the fund’s prospectus. In some cases, there can be some hidden costs to the investor like undeclared retrocessions (kick-backs, finders or trailer fees) that are paid by the distributor to the intermediaries from the fund’s portfolio. The investors should generally be cautious about such hidden costs. The latest regulations in US and Europe try to eliminate such expenses that are hidden from the shareholder. Note: You can download supplementary PowerPoint slides for this article from the download page. Highly recommended. Well organized, up-to-date (as of 2011), readable and understandable. I learned a lot from this book about the fund industry. Neat and compact summary of mutual fund expenses for investors. This entry was posted in Fee and commission calculations and tagged distribution fees, expense ratio, fund industry, fund services, management fees, mutual fund, service fees. Bookmark the permalink. Thank you for this overview and the downloadable slides. One thing I didn’t quite understand: Is trailer fee a harmless passthrough payment as a sort of revenue share, or a hidden cost to investor? Another question: Do you know what “payout rate” means? This is a term I often see in the fund business. Whether the trailer fee paid to intermediaries is a hidden cost or not depends on how the payment is financed. For example, if the distributor (principle underwriter) pays the trailer fees with a portion of official 12b-1 fees it receives annually from the fund, this won’t be a hidden cost because 12b-1 fees are declared in the fund’s prospectus and the pass-through trailer fee payment does not incur an additional cost to shareholders. But if the trailer fees are paid from the fund without an explicit declaration to shareholders, this will be a hidden cost, because shareholders will be paying for the trailer fees indirectly from their fund assets without being aware of it. The term “payout” can have different uses, but one use I know is the share of trailer fee received by a intermediary which is passed to the financial adviser of the clients, that is, shareholders. Thanks a lot for this comprehensive summary. Could you please clarify position of performance fees in mutual funds fees. Are they an alternative to transactional fees or management fees? I’ll be glad if you can explain further, different mutual fund types, in one of your next posts. My recent article “Simple Performance Fee Calculation” that I published possibly after your comment explains in one section the use of performance fees in the investment fund industry. Summarized shortly, performance fees are quite common among hedge funds, but only a small minority of mutual funds, about 3% of retail funds in US, use performance fees for the remuneration of their investment managers. Most mutual funds pay only management fees for investment management. In most cases, performance fees are paid in combination with a management or basis fee. The rate of management fees are naturally reduced if there is an additional performance fee for the investment advisery. Typical hedge fund rates are about 2% annually for annual management fees (applied on assets under management) and 20% annually for performance fees. Note that hedge funds are high risk investments with much larger expected returns compared to mutual funds.